There are many versions of "T" blocks. The Ts in a Ring quilt block uses four "Ts" and rotates them in each of the four quadrants of the block. 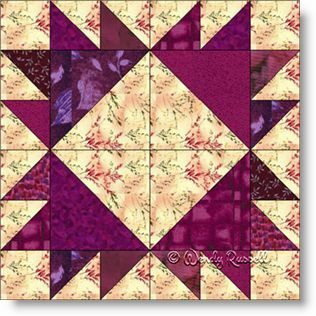 This quilt block is made only with half square triangles, but in two different sizes. I have chosen to make this quilt block as a scrappy version, using a variety of fabrics for the dark parts of each half square triangle. When you construct this block as a four patch, you will be surprised at how quickly all the parts go together. The sample quilts illustrated look very different, and once again, you can get really creative in the construction of your final project.